Tasty Lip-Smackin' Fried Chicken | Let's Cook With Bry! Having grown up in Maryland, with not one but two moms who were also from the South, you’d think I’d enjoyed a lifetime’s worth of delicious, home-made fried chicken. Somehow, that quintessential Southern staple never made it to our dinner, or picnic, table. My second mom continues to pine for the fried chicken that HER mom, my Nan, made for her. Well, pine no more, for I have discovered the recipe! To be fair, I must give credit where credit is due: a friend brought this to my most recent Superbowl party potluck, and he discovered the recipe in none other than Bon Appétit. I decided to try it myself, and Colonel Sanders himself couldn’t have been more pleased with the results! 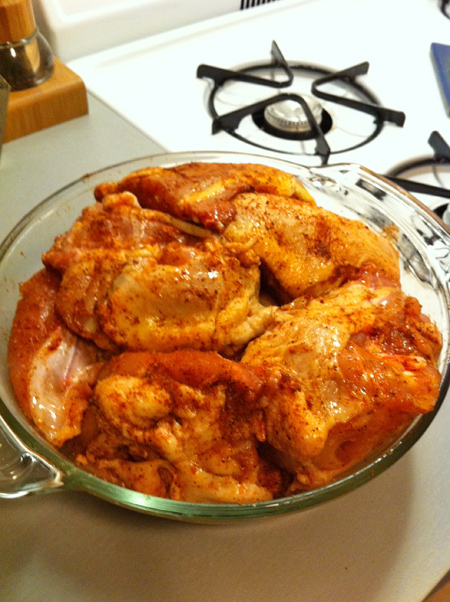 Let chicken stand covered at room temperature for 1 hour. Whisk buttermilk, egg, and 1/2 cup water in a medium bowl. Whisk flour, cornstarch, remaining 1 Tbsp. salt, and remaining 1 Tbsp. pepper in a 9 x 13 x 2″ baking dish. Pour the peanut oil into a 10″–12″ cast-iron skillet to a depth of 3/4″. Prop your deep-fry thermometer in the oil so bulb is submerged. Heat over medium-high heat until thermometer registers 350°. Meanwhile, set a wire rack inside a large rimmed baking sheet.Working with 1 piece at a time (use 1 hand for wet ingredients and the other for dry ingredients), dip chicken in buttermilk mixture, allowing excess to drip back into bowl. Dredge in flour mixture; tap against bowl to shake off excess. Place 5 pieces of chicken in skillet. 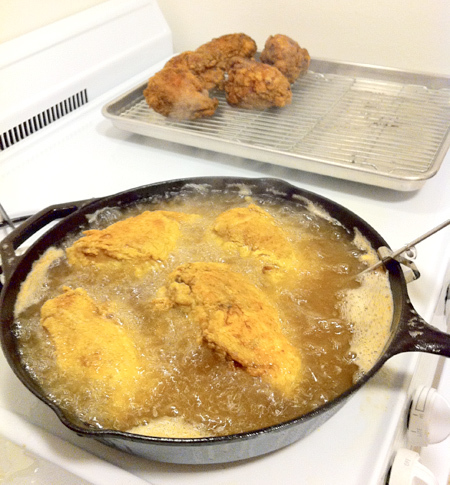 Fry chicken, turning with tongs every 1–2 minutes and adjusting heat to maintain a steady temperature of 300°–325°, until skin is deep golden brown and an instant-read thermometer inserted into thickest part of chicken registers 165°, about 10 minutes for wings and 12 minutes for thighs, legs, and breasts. Using tongs, remove chicken from skillet, allowing excess oil to drip back into skillet; transfer chicken to prepared rack.Repeat with remaining chicken pieces; let cool for at least 10 minutes before serving. 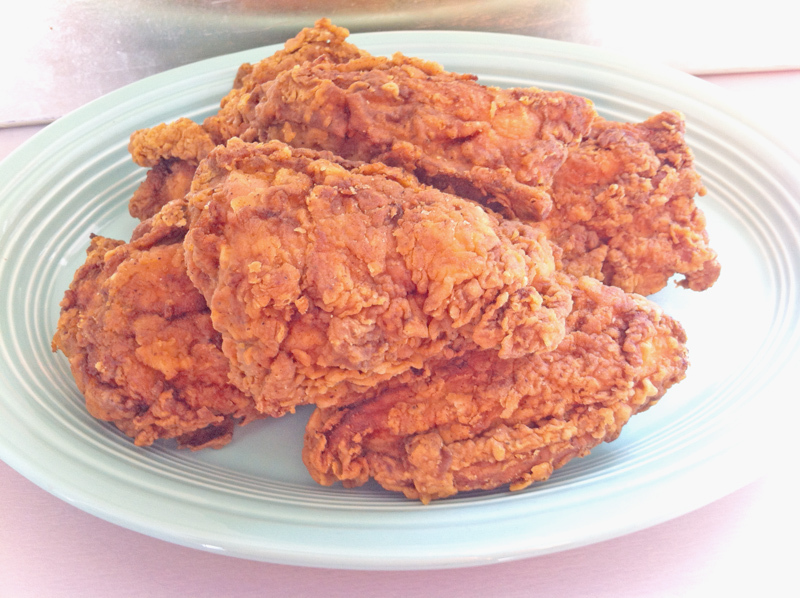 Pingback: Louisiana Crunchy Oven Fried Chicken | Let's Eat With Bry!